There was plenty of wholesome sporting action in the month of February, including the Super Bowl, NBA All-Star weekend, Champions League and more. We look back at it all in this comprehensive monthly review. In this article, we take a look back at the best news stories and biggest sporting events for the past month of February 2014, including the best football news, stories from American Football, wrestling, F1, UFC and many more. There was some blockbuster football action with big Premier League games including Arsenal vs. Manchester United, Liverpool vs. Arsenal and Manchester City vs. Chelsea, with the two latter games also being played in an entertaining FA Cup fifth round. As for football around Europe, the cups took shape along with a topsy-turvy spell at the top of La Liga - plus the return of the Champions League with some mouth-watering European ties. At the MetLife Stadium in New Jersey, the Super Bowl culminated the NFL season in surprising fashion, with the Seattle Seahawks' rout of the Denver Broncos. New Orleans played host to a fun weekend that would mark the halfway point of the NBA season. The East All-Star team would prevail in the highest-scoring All-Star game of all time in the 63rd annual edition of its kind. The Octagon was also catapulted into the spotlight featuring three title fights as the Bantamweight, Featherweight and Women's Bantamweight Championships were defended across two PPV events along with another main event in Jaragua, Brazil. There was all that, and plenty more. Here's an in-depth look at the best sporting action in February. Manchester City's impeccable home record was tarnished by Branislav Ivanovic's lone goal of the game as Chelsea leapfrogged them and eventually would finish the month atop the Premier League. At Anfield, Liverpool sent shockwaves through the nation with a dominant 5 - 1 win over then-League-Leaders Arsenal - on that same weekend, TheSportMatrix team were in attendance for Aston Villa vs. West Ham - where the Hammers would triumph in one of four consecutive league wins as they bounced back. Fulham thwarted Manchester United's hopes in a very turbulent month for the Champions. There would be two managerial-changes in the Premier League - Michael Laudrup (Swansea) and Rene Meulensteen (Fulham) were relieved of their duties. Another blockbuster game was featured at Old Trafford, although it was far from a good game, Arsenal drew goalless with Manchester United - while storms delayed two other games on the same night. In the final gameweek of the month, the top four would keep up the pressure on one another with wins at home - topped off with a thrilling 3 - 2 win for Liverpool over Swansea in the game of the month. It was a groudbreaking month of Spanish Football for TheSportMatrix.com, with correspondents in attendance for Real Madrid's 4 - 2 win over Villareal, and Barcelona's six-goal masterclass against Rayo Vallecano. The Copa Del Rey final was sealed for April, as two of the best in Spanish football secured a date with one another - Barcelona and Real Madrid were poised to face each other in the final on April 19. Real Sociedad would thwart Barcelona with a 3 - 1 win, while Real Madrid would take forward the momentum to top. The fifth round of the FA Cup would feature two block buster games with the Top Four in the League. Manchester City defeated Chelsea 2 - 0 to get vengeance on their defeat at the start of the month, while Arsenal would bounce back one week after their 5 - 1 loss, to beat Liverpool. It was a weekend that indeed restored the importance of the FA Cup - that many thought had faded. Once again, the pinnacle club football would return. The first legs of the knockout stage would start of at the Etihad Stadium, where Martin Demicheilis' sending off proved costly for City as they lost by two goals. Paris Saint-Germain would further reinforce their European intents with a four-goal away rout of Bayer Leverkusen. It would be a phase of the tournament where none of the top four English clubs would win, Arsenal had nothing to show for their efforts against Bayern, and Olympiacos stunned a lackadaisical Manchester United. As for Chelsea, they drew 1 - 1 with Galatasaray. In a steam rolling month for the Berneabeu occupants, Real Madrid thrashed Schalke 6 - 1. Dortmund beat Zenit 4 - 2 and Milan drew 1 - 1 with Atletico in the other Champions League games. In the Europa League, the last sixteen line-up was completed. Tottenham were the only English club to progress, joining Sevilla, Juventus and others in the second knockout stage. Everything seemed to edge closer to importance in one of the cornerstone months of the season. Its safe to conclude that La Liga and Premier League title races will be close ones, and domestic tournaments would embark on a resurgence. In addition, the Champions League delivered more dramatic football. 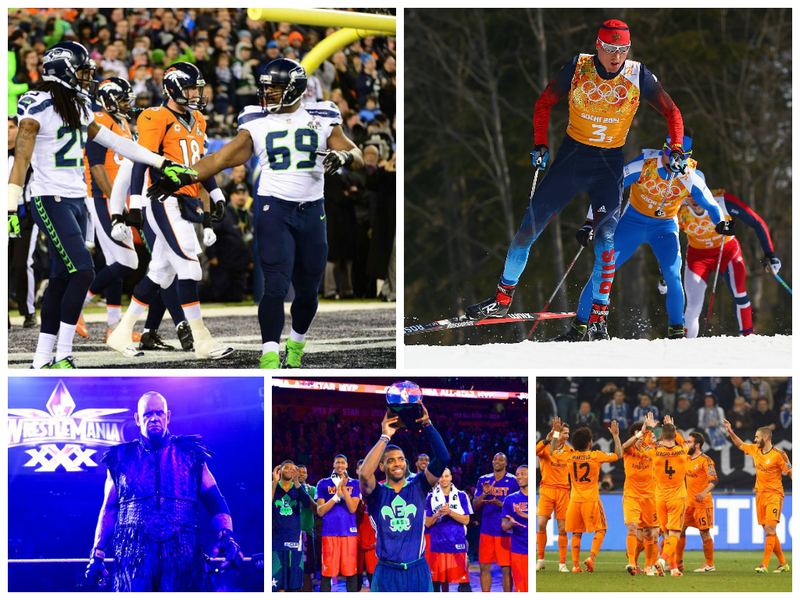 Throughout February, the Winter Olympics took center stage providing some remarkable moments. Shaun White's failure in the Snowboard Halfpipe paved the way for a new Champion, in one of the biggest stories of the games. Meanwhile, Canada's triumph in the hockey and the rise of curling popularity was part of Russia's show. There was plenty of tennis dotted around the Globe in the February. Venus Williams won the title in Dubai to continue to state herself as the best, while Rafael Nadal's return in Brazil was a successful one, defeating Alexandr Dolgopolov in his forty-third clay title win. MetLife Stadium was poised for a SuperBowl showdown between the #1 seeds in the NFL - Denver Broncos' best offense went toe-to-toe with the Seahawks' best defense - but it would be far from a close battle. Although doubts of poor weather pushing the date of the SuperBowl back because of snowstorms, the game would go ahead and would be a problematic outing for Peyton Manning and the Denver Broncos - losing points on the first possession. For the first time in franchise history, the Seattle Seahawks would lift the Lombardi Trophy after a 43 - 8 win over the Denver Broncos. History was made. New Orleans played host to the most anticipated weekend on the NBA Calendar, the 2014 All-Star weekend featured prime talent from the league including a record-breaking All-Star game. John Wall was the victor in the Dunk Contest on the Saturday night, which featured Chris Bosh solidify his second shooting stars' title, Spurs' Marco Belinelli win the Three Point shootout and Lillard & Burke won the skills challenge. However, this line up of events with changed formats was against the preference as many, with calls for them to be reverted to the more entertaining and original. East finally beat West in a record-breaking All-Star game. It was the highest-scoring game of all time with Cavaliers' Kyrie Irving took home the MVP award, and there were plenty of extraordinary plays like we'd expect in a great game. There was a much bigger feel to it this time round, an excellent game to watch. On the first night of the month and on the last, Miami HEAT were victorious against the New York Knicks with convincing wins. LeBron James would break his nose in the same month against the Thunder, as he and Kevin Durant jockeyed for top spot in the MVP race. Russell Westbrook would make his return in the league also. The Trade Deadline would occur too, with rumors taking center stage although no 'big' ones came into fruition. Two major PPV events were featured in February in the Octagon, starting with Super Bowl weekend. Renan Barao and Jose Aldo were victorious at UFC 169 to defend their titles, defeating Urijah Faber and Ricardo Lamas respectively. In Jaragua, Brazil, Lyoto Machida - who now has a title shot against Chris Weidman in May - defeated Gegard Mousasi over five rounds. On February 22, Ronda Rousey kept hold of the Women's Bantamweight strap after the quickest knockout in Women's UFC, dispatching Sara McMann in just over one minute. Optimism was increased by tenfold when images emerged of Anderson Silva training after his severe leg injury at UFC 168. In a groundbreaking month for WWE, The Undertaker and Hulk Hogan made their profound returns gearing up for WrestleMania 30, along with the Elimination Chamber PPV in February. Randy Orton would be victorious in the Elimination Chamber, and the Wyatt Family defeated The Shield in an epic tag team match. The launch of the WWE Network brought in great vibes for the company, with The Undertaker returning to conclude a phenomenal episode of Monday Night RAW on February 24, where he set a match with Brock Lesnar for WrestleMania 30. On that same night, Hulk Hogan returned, and prepared for his job as WrestleMania host. Former WWE King of the Ring, Nelson Frazier Jr. (also known as Big Daddy V, Viscera or Mabel) passed away at the age of 43, with an outpour of tributes for WWE's larger-than-life superstar. Bernie Ecclestone was in the news for his F1 doings, as the rules, regulations and practice were hotly contested in the month preparing for the start of the season. In cricket, Kevin Pietersen's England career was ended, as the turnaround for England's cricketing future continued. There was plenty of matchmaking in boxing too, with Amir Khan missing out on a chance to face Floyd Mayweather, while Froch vs. Groves II was set - possibly the biggest rematch ever seen in British boxing. It was a jam-packed month of sporting action that was great to watch. Look back for plenty more articles related to this in our archive. Well that is all for February in the sporting World. Keep checking TheSportMatrix for plenty more sporting coverage, reports, analysis, opinion and much more. A full review for all the sports in February 2014, with the Super Bowl, NBA All-Star weekend, Champions League football and more.